Railroad ballast regulators are an integral part of railroad maintenance and simply by the name you probably have a good idea of what they do. A newer machine in the world of railroad maintenance before regulators their work was accomplished through a combination of Jordan Spreaders and manual labor. Ballast regulators are one of the last, if not the last, machines you will see during track maintenance as they follow behind the tamper (which makes sure the ballast is situated underneath the ties for proper support) and work to properly sculpt new crushed stone (which has been dumped on the rails and ties) evenly across the right-of-way. In doing so regulators clear the stone from the ties and also angle the ballast to the proper slope so that efficient drainage is restored. 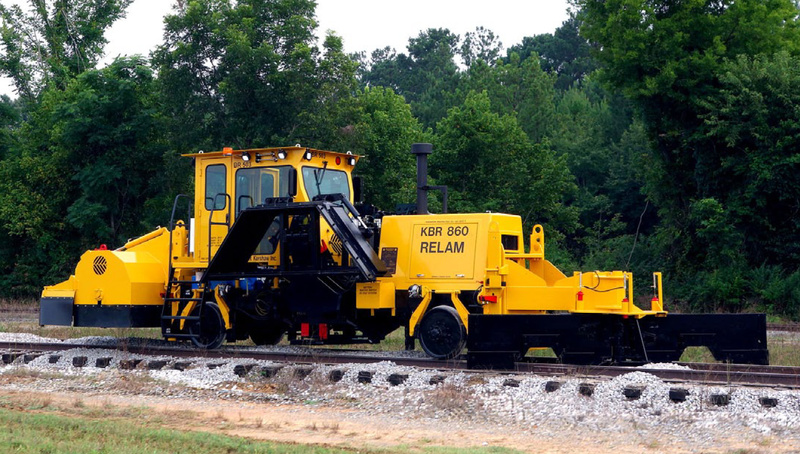 Railroad ballast regulators are essentially a Jordan Spreader, replacing the iconic maintenance machine decades ago on Class I railroads as the primary means in which to contour ballast (partly because regulators are self-propelled and Jordans are not). Like the Jordan Spreader, ballast regulators also can be equipped to handle multiple tasks. 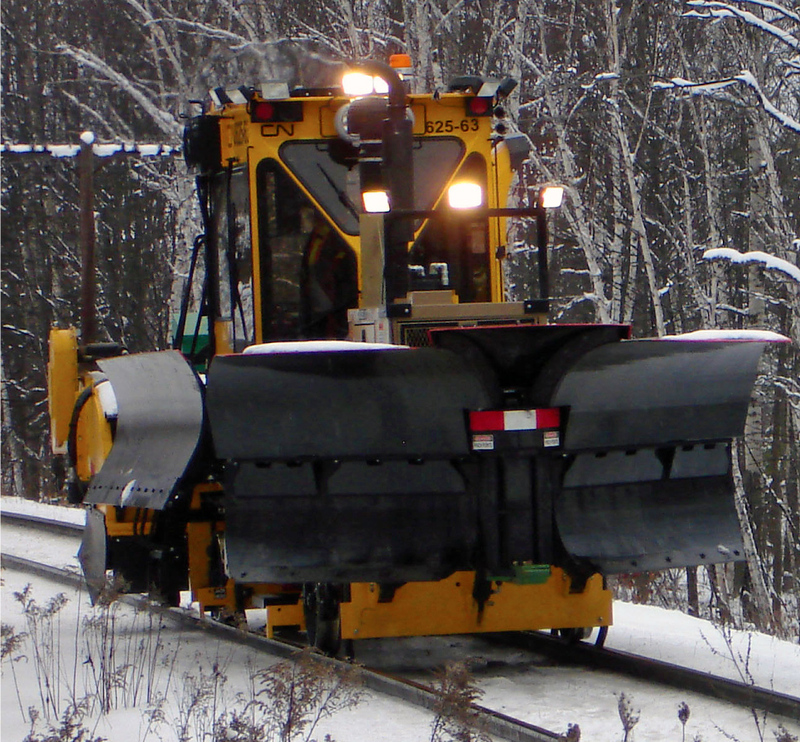 Aside from ballast profiling these include plowing snow, cutting brush, and cleaning or digging ditches. Jordan Spreaders are the earliest type of true maintenance equipment employed by railroads. Extremely simple machines by design it was developed by Oswald F. Jordan in the very early 20th century and consists of almost no moving parts. Not only is the Jordan able to dig and effectively clean ditches it can also properly regulate ballast and even plow snow if needed. Today, the Jordan Spreader has mostly been replaced by newer, faster, and more efficient machines but it still finds work on some railroads usually in profiling or snowplowing. Interestingly, even after nearly 100 years since it was first developed the Jordan still finds use today. Railroad ballast regulators almost always work as some kind of mechanized gang, usually as part of a tie or rail gang (which today normally consists of an army of machines, not men). Today's tie and rail gangs include such machines as spike or rail anchor pullers (which pull the spikes/anchors clear of the tie), tie cranes (which remove the railroad ties once they are free of the rails), tie extractors/inserters (different from a tie crane these machines work vertically to remove or replace the railroad tie from underneath the rail), and spike inserters (as you might have guessed these machines use hydraulics to quickly drive spikes down in the tie plate and tie itself). If very heavy work is being done other large equipment will be used such as a mechanized tie relaying machine (which is essentially a type of railroad tie inserter) and/or even a rail train if new rail is to be laid. As it is, tie and rail gangs may look like machines simply heading off to work in an elephant line. However, they are actually very coordinated work details with each machine and accompanying operator assigned a very specific task to get the work done as quickly as possible. The reason for speed and hastiness in finishing a maintenance job is simply, to keep the trains and goods moving. Delays are quite costly and avoided at all costs because if the freight isn't delivered the railroad's don't get paid! 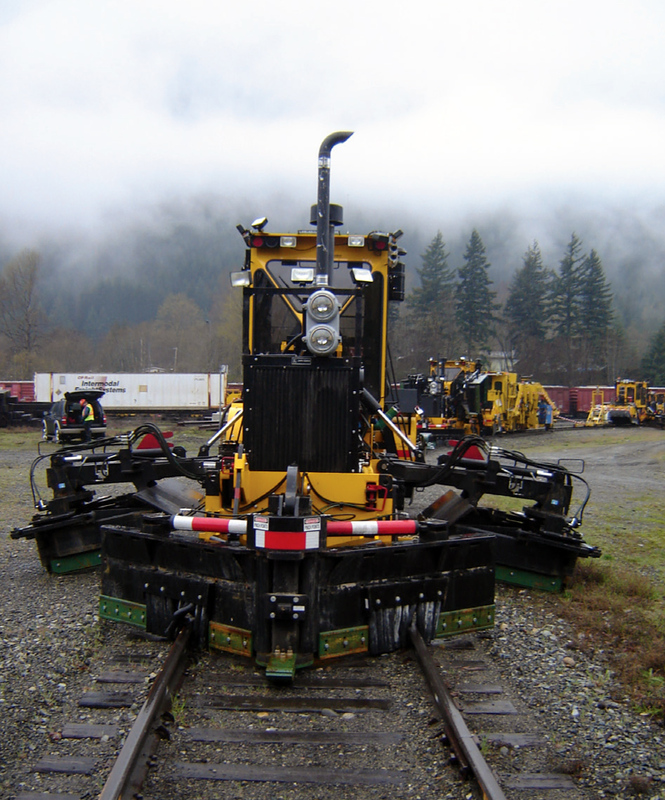 A railroad ballast regulator's primary tool is, of course, it's double-angled and double-sided blade. This piece of equipment can be adjusted up and down to push the ballast clear of the rails and ties, depending on the exact contour desired and how much ballast is obstructing them. However, more than just being able to ride along linearly clearing and sculpting, many of today's regulator models feature tilting blades if there are large amounts of ballast lying to either side of the rail. Two other tools found on the machine are ballast boxes and brooms. The ballast box can move outward from the rail laterally and helps to move stray ballast that has pushed or slide too far away from the outside of rails closer to them. The tool also helps in providing a proper contour and overall profile. Finally, there is the broom. As you may have guessed the broom simply sweeps away access stones where they are not needed, particularly on the tops of the ties between the rails. Made up of spent air hoses the broom rotates at very high speed clearing away these stones to placing them to the outside of the rails. 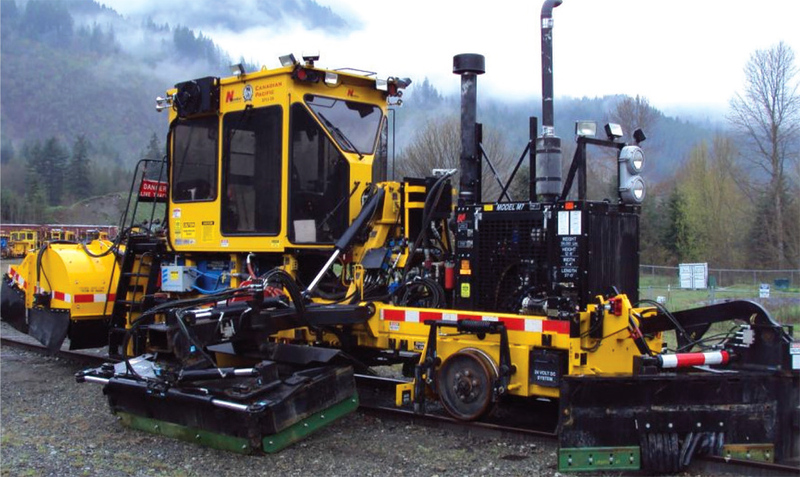 Virtually everything on the machine is hydraulically controlled and ideally a railroad ballast regulators should be able to sculpt, profile, and neatly manicure a right-of-way with one pass. However, it's not uncommon to see an extra pass of two of the machine to get the job done. And, all of this is done with a single operator at the controls as most machines are no more than 15 or 20 feet in length with a 360-degree windowed cab perched above the operating equipment so the operator has maximum visibility (some newer models even tilt a bit to give the operator even better visibility).